John Noel Smith’s paintings tend to be generally self-assured and emphatic, regardless of scale. Yet the best of them are also tinged with a certain equivalence or disequilibrium, while nonetheless retaining their own blunt elegance. This is as true of his recent works as it has been of his work over the past three decades and more. For many years, especially those he spent living in Berlin, between 1980 and 2002, Smith was primarily concerned, as he has repeatedly stated, with questions of identity and, in a fundamental sense, of language. These are, of course, characteristic concerns of the exile, whether voluntary or involuntary. Given that he largely cleaved to an abstract idiom, in spite of the renascent figuration with which he was surrounded on his arrival in Germany, these concerns were of necessity articulated obliquely for the most part. Now and then, however, a series of paintings was pursued – Smith has usually worked in series – in which the central motif or underlying compositional stratagem signalled these themes more directly. Chief among these are the ‘Knot’ paintings of the early 2000s, in which the eponymous motif, signifying complicated connection, also contrives to resemble a fleur-de-lis and, more pointedly, a three-leaved shamrock, as well as the several series of ‘Ogham’ paintings that preceded these works. The stacked vertical columns made up of short scored lines, which typify the ‘Ogham’ paintings, suggest the kind of ostensibly universalising sign system to which many artists from the 1960s and 1970s were attracted, while at the same time alluding to a form of early Irish notation that is culturally and linguistically specifi c. Both the recourse to multivalent motifs in the ‘Knots’, on the one hand, and the deliberately inconclusive shuttling between the general and the particular evidenced by the ‘Ogham’ paintings, on the other, are of a type. They are consistent with Smith’s deployment, at once instinctive and strategic, of what might be termed an ‘emblematics of estrangement’. It is interesting to see how his work has evolved over the seven years since he resettled in his native Ireland. Certain continuities are evident, of course, including a characteristic chromatic intensity and a pronounced physicality in paint-handling, both of which are tempered by a preference for dry, almost fresco-like surfaces. On an initial viewing of this most recent body of work, the most obvious development is a marked increase in compositional complexity. Even in the smallest of these new works the painting tends to be divided into three or four more or less discrete rectangular sections abutting each other along a horizontal axis that can easily be imagined to be extendable. (In conversation it becomes clear that the artist conceives of some of these paintings, at least, in the notional form of a wrap-around composition somewhat akin to a serpent biting its own tail.) Some of the differentiated quadrants in these pictures command their own individual stretchers, especially in the larger works, while others vie with their neighbours for stretcher-space. In keeping with such compositional complications, Smith’s consciously limited formal lexicon has also been significantly augmented. Previous bodies of work have used, in addition to the knot motif and the ‘ogham’-related markings already noted, a rudimentary checkerboard pattern, as well a teetering, Brancusi-like column made up of segments of alternating colour. Lately, a number of new compositional building blocks have been added to the mix. Two of these predominate: the monochrome canvas, or expanse of canvas, and the all-over, cross-hatch pattern. Both of these carry signifi cant art-historical ballast. If the monochrome is, in some ways, the ne plus ultra of a form of painterly abstraction that tends toward ‘fl atness’, cross-hatching is a traditional graphic means of adding depth or volume to an image. Yet we might note that, in a series of paintings begun in the early 1970s, Jasper Johns effected a crucial detournement of this crosshatch pattern, so that in his hands it came instead to signify, however contrarily, a peculiar form of painterly flatness. While this Johnsian echo in Smith’s work is far from strident (it is also accompanied by echoes of early Malevich, not to mention the Mondrian of Pier and Ocean, 1915), something of this antecedent gesture’s inherent perversity is carried through in Smith’s painterly concatenations. My intention is to set up the whole field of the canvas as a coherent structure, every part exercising the necessary pressure on the other. My stratagem is to shift the emphasis away from a single dominant idea to a flotilla of interrelated fl uid concepts, which add up to a Gesamtbild, one which is about potential cohesion and lucidity as opposed to fragmentation and incoherence, hopefully recovering a sense of integrity in the process. This Gesamtbild, or ‘overall picture’, is thus imaged by the artist as a small fl eet of disparate but co-ordinated vessels, each of which is assumed to convey its proper freight of meaning, however partial. Needless to say, the various motifs and patterns juxtaposed within the bounds of an individual painting should by no means be taken to be semantically stable. Yet they bear with them the memory of previous usage, both within the particular context of the artist’s earlier work, and in the broader history of twentieth-century painting. The accumulating stress in the statement just quoted on the notions of potentiality, hope and recovery serves to remind us of the destination on which Smith’s (and any other artist’s) various compositional gambits and devices ultimately converge. This is, of course, the individual viewer, whose accommodating receipt of all of a given work’s aspects can never be comprehensively guaranteed. 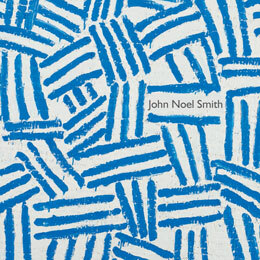 For the time being, it is some indication of the animating restlessness at the heart of John Noel Smith’s painting that his return home has so far produced a body of work that is at least as adventurous and as aspirational – as ‘provisional’, in all senses of that word – as that produced during his many years abroad. John Noel Smith – Pandect Series. Dublin: Hillsboro Fine Art, 2009.